Synopsis: An empty mind is a safe mind. Yulia's father always taught her to hide her thoughts and control her emotions to survive the harsh realities of Soviet Russia. But when she's captured by the KGB and forced to work as a psychic spy with a mission to undermine the U.S. space program, she's thrust into a world of suspicion, deceit, and horrifying power. Yulia quickly realizes she can trust no one--not her KGB superiors or the other operatives vying for her attention--and must rely on her own wits and skills to survive in this world where no SEKRET can stay hidden for long. I like the concept of Sekret. Espionage and psychic mixed together make for a really good book. However, I have to say that at times it was a little hard to get into the book because of all the Russian names and some of the descriptions. If I was interrupted or stumbled on a word, I had hard time getting myself to focus all over again. While it took some time for me to finish the book, I'm curious to see what will happen to Yulia in the next book. Lindsay Smith managed to create such a vivid setting and it definitely felt very authentic. The way that the psychic teenagers are being used was sad and hard to read at times. 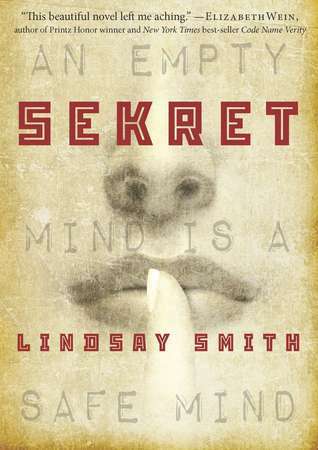 After a shocking secret is reveal almost at the end of Sekret, I'm curious to see what Lindsay Smith will do next. And I sincerely hope that Rostov, the villain gets a slow and painful death.